Why Focus on Fine Motor Skills? We know that activities to improve fine motor skills often involve learning to use the hands in a range of ways, as well as developing greater muscle strength and control in the small muscles which control the fingers and the hand. We need to be able to effectively use fingers together and in isolation, make a fist, grip, organise and plan an intricate movement, and make choices about the amount of force needed for a movement. To do this well requires integrated movement control as well as a well-balanced body and a stable seating position. It also requires planning, timing and concentration, so ensure you have the level of noise and distraction under control. 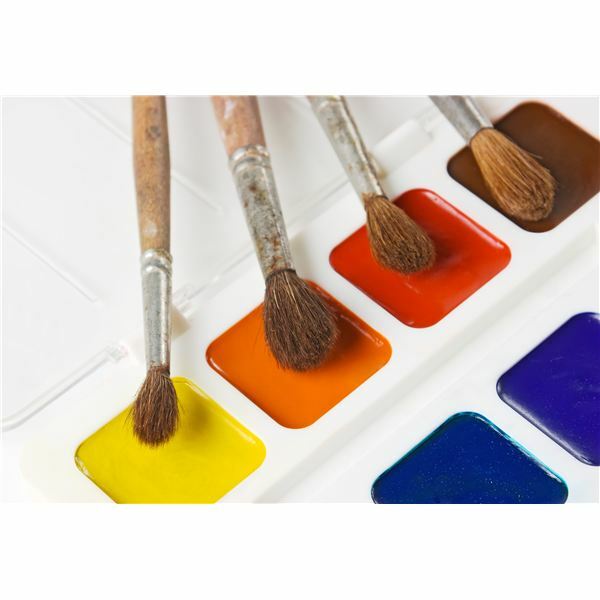 This modified art lesson plan is designed to introduce students to a range of ways to apply paint to a surface, and to use their observation skills to understand how primary colors blend together to create secondary colors. 1. Sponge application – students apply two primary colors to a surface using a sponge. The basic way of doing this is by using the sponge held in the hand – encourage a good strong grip and use of all the fingers and fingertips. Students observe the new secondary colors created. 2. Sponge variations – students apply primary colors using a sponge gripped in a peg or a pair of kitchen tongs. This encourages hand strength and dexterity, as well as adding a note of fun and humor to the task. Again, students observe the colors created. 3. Squeeze bottle spraying – students spray a mixture of primary color paints and water in two squeeze bottles to a surface which creates a spotted, dappled effect. They may enjoy then folding the paper in half to create a butterfly image and observing the changes in the effect created by the paint. 4. Balloon fun – squirt some paint into a few balloons and allow the students to enjoy throwing them as hard as they can against paper placed on the ground (outside!). This is a great activity for observing the wonderful effects of paint being splattered randomly across a surface, and learning about color blending at the same time. These are all wonderful and fun activities to improve fine motor skills in students, and can be done in a special setting or as a modified lesson plan within a mainstream art class where other students are learning about blending color on a palette or with a range of brushes.